Filipino empanadas are somewhat nostalgic for me. I remember picking them up from a fast food restaurant in a double paper bag that quickly grew translucent with oil. Then, I learned how to make them from my mother and father, but we prefer to bake the empanadas with an egg wash rather than deep-fry them. They are less greasy, and we make the leap to thinking they might actually be healthy. 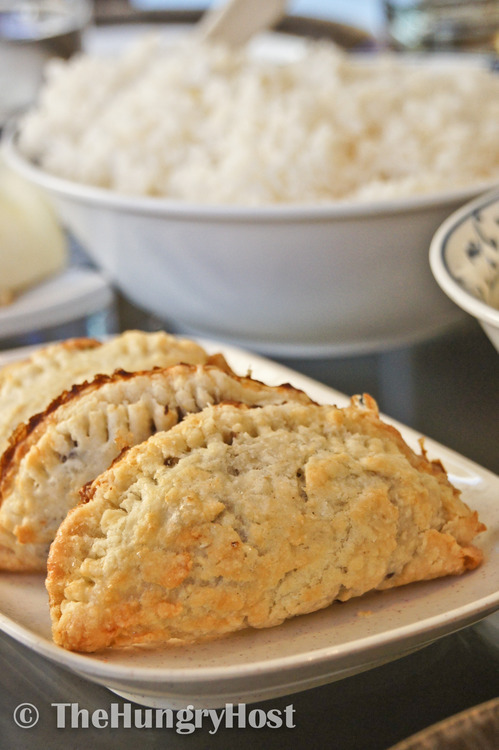 Regardless, they are delicious with a flaky, tasty pastry and a meaty filling. Begin by making the crust. Put flour, salt, and sugar in a food processer and pulse until mixed. Add the butter and pulse until the mixture resembles coarse crumbs. Add the ice water and pulse until it clumps slightly. (Alternatively, you can use a pastry hand blender or your fingers.) Turn the dough out and form into a flattened ball. Wrap with cling film and refrigerate while you prepare the filling. Fry the onion and garlic in oil over medium heat until soft. Add the potato cubes and fry until almost cooked. Add the ground beef and water or beef broth. Cook through. Add the frozen peas and flour and mix well. Cool the mixture to room temperature. Preheat the oven to 400 degrees Fahrenheit. Roll out the dough to ¼ of an inch. Cut into circles. 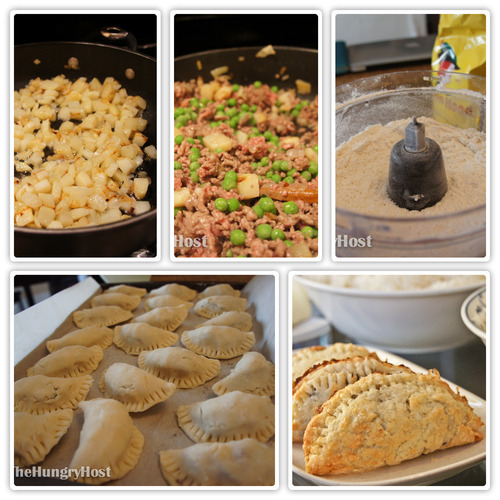 Fill each circle with a few tablespoons of meat, fold over and pinch the edges to seal. Press the edges with the tines of a fork. Arrange the empanadas on a baking sheet. Mix the egg whites and milk in a small bowl. Brush the tops of the empanada with this mixture and then bake for 25 minutes or until golden brown.